Reading and share top 19 famous quotes and sayings about Extended Family by famous authors and people. Browse top 19 famous quotes and sayings about Extended Family by most favorite authors. 1. "If a person is mean to their family but polite to complete strangers, they shouldn't go to extended family reunions – until they've mastered the diplomacy of sarcasm." 2. "My son has two loving parents and an extended family, whether it's cousins or stepmothers or boyfriends. My son is surrounded by love." 3. "I had dreamed of visiting Bali for many years and because I had an extended family of Balinese friends in Los Angeles, I felt connected. The island is so peaceful and the smiles are constant." 4. "I took time off from school and traveled to Italy when I was 19, living with my extended family members. 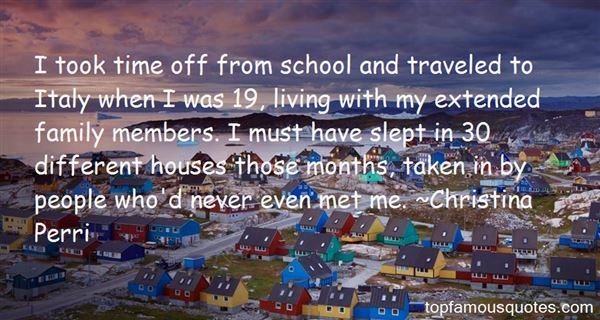 I must have slept in 30 different houses those months, taken in by people who'd never even met me." 5. 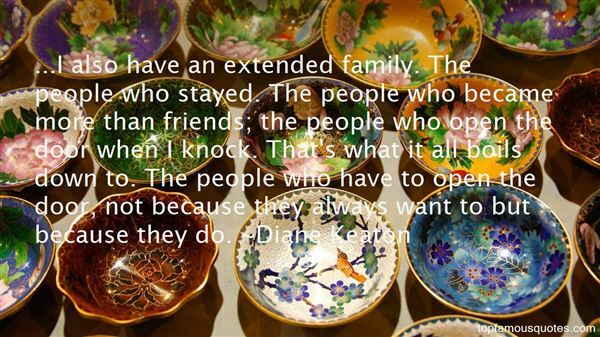 "...I also have an extended family. The people who stayed. The people who became more than friends; the people who open the door when I knock. That's what it all boils down to. The people who have to open the door, not because they always want to but because they do." 6. "In the West, the basic economic and social unit is the individual; in Africa, it is the extended family or the collective." 7. "Arranged marriages are big business in the U.K. Second- and third-generation immigrant families, with no extended family structure, limited networks and religious restrictions on acceptable ways to meet future spouses, are turning to external matchmakers for help." 8. "I don't want you to think I don't love my extended family. I do. I just don't want to be around them. Some of this is because I'm a loner. Some of this is because at family gatherings you are forced to face the short genetic distance between you and a clinically insane person." 9. "I meet people from really grand backgrounds who had horrible parents who took no interest in them, whereas I'm a working-class boy from Deptford who was worshipped by all my rellies. Everybody in my extended family helped to raise me, and I realise now how lucky I was to grow up among kind folk." 10. "(The extended royal family, including progeny of Abdul Aziz's siblings, is said to include roughly thirty thousand members.)" 11. "But when I roamed New York City, knowing so much and capable of speaking so nicely, and yet so lonely, and often hungry and cold, I learned the joke at the core of American self-improvement: knowledge was so much junk to be processed one way or another at great universities. The real treasure the great universities offered was a lifelong membership in a respected artificial extended family." 12. "Email helps me keep in touch with my family. I wouldn't know what my extended family was doing every day if we weren't emailing each other." 13. "When I was young, I grew up in a family of working-class people. Not just my parents, but my extended family, as well." 14. "Black women's feelings of responsibility for nurturing the children in their own extended family networks have stimulated a more generalized ethic of care where black women feel accountable to all the black community's children." 15. "It is through our extended family that we first learn to compromise and come to an understanding that even if we don't always agree about things we can still love and look out for each other." 16. "Dying people in pre-industrial cultures typically died in the context of an extended family, clan, or tribe." 17. "A family's photograph album is generally about the extended family and, often, is all that remains of it." 18. 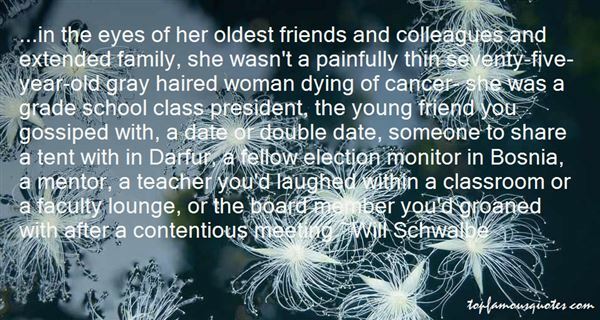 "...in the eyes of her oldest friends and colleagues and extended family, she wasn't a painfully thin seventy-five-year-old gray haired woman dying of cancer- she was a grade school class president, the young friend you gossiped with, a date or double date, someone to share a tent with in Darfur, a fellow election monitor in Bosnia, a mentor, a teacher you'd laughed within a classroom or a faculty lounge, or the board member you'd groaned with after a contentious meeting"
19. "And what of my extended family-birds, beasts, and reptiles? They too have drowned. Every single thing I value in life has been destroyed. And I am allowed no explanation? I am to suffer hell without any account from heaven? In that case, what is the purpose of reason, Richard Parker? Is it no more than to shine at practicalities-the getting of food, clothing and shelter? Why can't reason give greater answers? Why can we throw a question further than we can pull in an answer? Why such a vast net if there's so little fish to catch? (pg. 98)"
The musical is amazing. i mean,i don't throw around that word very often unless im talking about myself. Being humble is one of my many fine qualities.IGN Interview May 2009"